Implementation will start less than two weeks after Mayor de Blasio gave it the go ahead. When the city decides to act on street safety, it can act fast. Case in point: DOT will begin implementing the redesign of 111th Street in Corona on Monday, less than two weeks after Mayor de Blasio said the project would proceed. 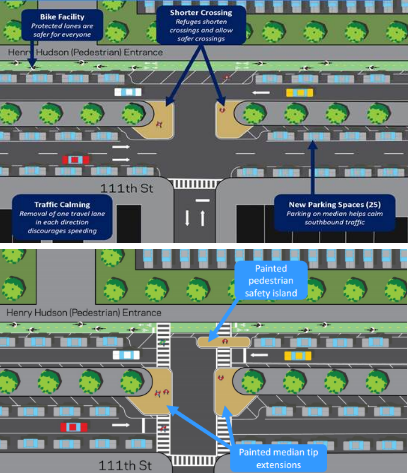 By shortening crossing distances and adding a two-way protected bike lane, the redesign will make 111th Street less highway-like and reduce the risk of walking or biking to Flushing Meadows Corona Park. De Blasio gave the redesign the go-ahead last week at a town hall in the neighborhood, following a protracted two-year advocacy campaign to get the project built. Hundreds of people demonstrated for the redesign at rallies on 111th Street and at City Hall to overcome opposition from Queens Community Board 4 and Assembly Member Francisco Moya. While it’s a big improvement over the status quo, the design that will be installed next week is a watered-down version that lacks the full complement of safety measures in DOT’s original plan. Transportation Commissioner Polly Trottenberg has said they agency will evaluate whether to add those features at a later date. Welp, if James Lisa said he wants to move anyway, what’s stopping the DOT from un-nerfing it sooner?